It may only be August, but today in Wisconsin, the high temperature was 68 degrees, it was cloudy, windy, rainy and quite, might I say, cold. At least compared to the rest of our summer, that is. We have had highs in the 80’s since March! While it has been wonderful to have all the warm temps, today was a nice change. It made me crave fall and all that comes with is. Pumpkin, apple cider, scarves, boots…well, you get the idea. And in case the cool day couldn’t have got any better, it was the first preseason NFL Packer Game. In fact, it’s on TV as I write this. Ahhh, I love football and I love my Pack. But, I’m not here to talk football, and frankly, you should be glad, because I don’t know that much about it. I know the ‘downs’, the scrimmage, huddles, and yes, I know when they get a touch down. 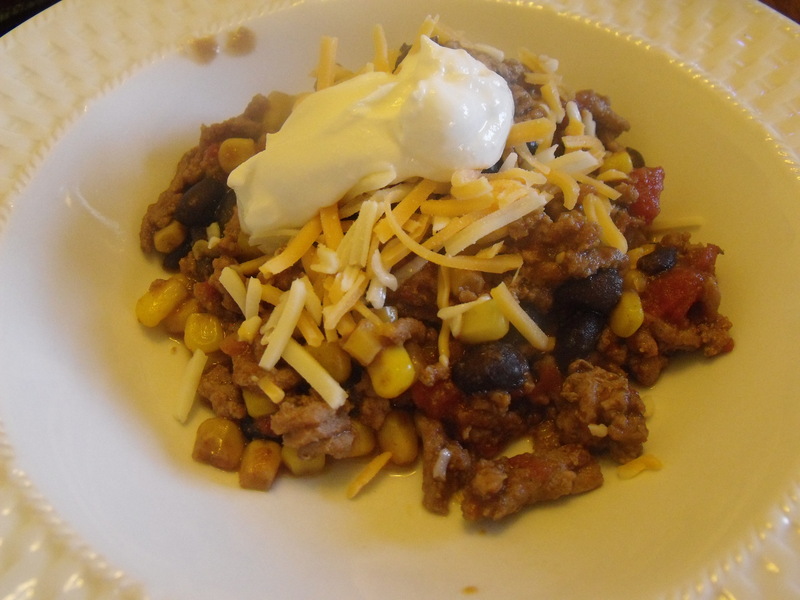 So what goes better with football season and fall, except chili? Let’s face it, it’s easy to make for a crowd (particularly men watching football), it’s delicious, you can make it however you want to. You could add noodles (which I happen to love, but since I’m eating clean, I like to add brown to mine), cheese, sour cream (or plain Greek Yogurt, in my case. Yes, it taste surprisingly like sour cream), hot sauce. Really, whatever you feel like goes. Another awesome thing about this recipe, you can make it all in one pot. One dish and you’re done. Yay! That’s my kind of meal. In a large pot sprayed with cooking spray, cook turkey over medium-high heat. Cook turkey until until no long pink; Drain, if necessary. Mix in the rest of the ingredients. Bring to a boil; then reduce the heat. Simmer uncovered for about 18 minutes, stirring occasionally. Top with desired topping and enjoy! Wow! I never in my life thought I’d be creating recipes! Yes, I did start with someone elses recipe, but man, when you don’t have the ingredients, or you want to make things healthier, you have to get creative! So, I was stuck as to what to make for dinner last night. Finally about an hour and half before I needed dinner to be ready and after ‘paging’ through my Pinterest boards and my cookbooks, I decided. Taco Corn Chili and Corn Bread. Two things that just go together. However, you don’t usually think about making them in August when it’s 85 degrees outside. Oh well. I had the ingredients (or at least most of them) and I was off! My first mission was to find a corn bread recipe that didn’t include butter. Since I’m eating clean, I can’t exactly add a pound of butter to everything I eat….sadly. And, yes, I will agree, the corn bread that includes butter and lots of sugar is delish! But, not nearly as delicious as knowing I can eat this and still feel good about it! In a medium size bowl, whisk together dry ingredients. In another bowl, preferably bigger than the other bowl, mix together the honey, egg whites, applesauce, milk, and coconut oil. Add dry ingredients to wet ingredients and mix until just moistened. 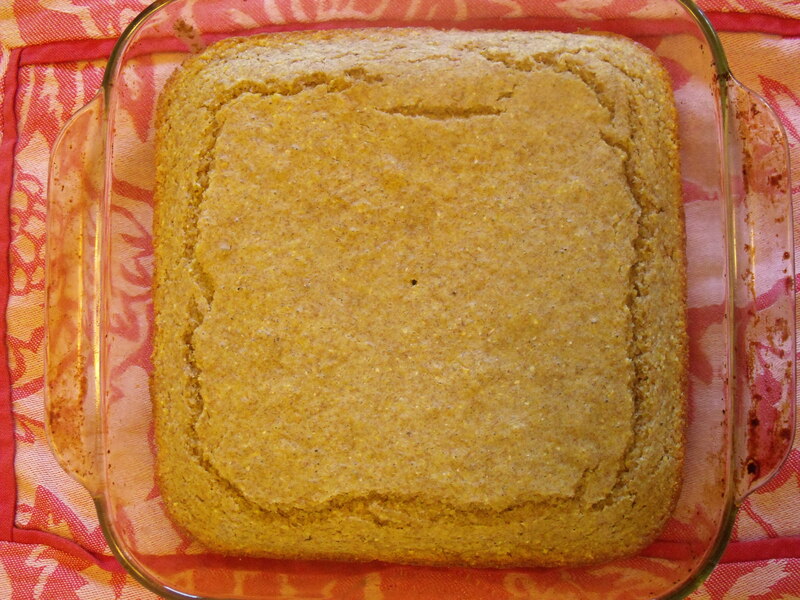 Grease an 8×8 inch baking pan. Pour mixture into the pan. Note: my cornbread wasn’t very sweet, so if you’d like it sweeter, just add a little more honey.